The NFL Draft kicks off tomorrow night in Chicago and the Browns will be on the clock with the eighth overall pick. Cleveland traded out of the number two pick last week in exchange for the Philadelphia Eagles number 8, 77, and 100 overall picks this year as well as their 2017 first round-pick and 2018 second-round pick. The Browns decided against taking a potential franchise quarterback with the number two pick in either Jared Goff or Carson Wentz. I thought it was a great move as Sashi Brown and Co. as they added to their already loaded arsenal of draft picks. Brown stated this week that he knows who he will pick tomorrow night and that he has a backup plan to trade down if his guy isn’t there. I will give you the players that I think the Browns will select in either situation, as well as my prediction for their second round pick. Elliott was named the Big Ten offensive player of the week for his performance Saturday; his 274 rushing yards ranks second in Ohio State single-game history behind only Eddie George’s 314 (1995). Sashi Brown said that the Browns are “locked in” on a player for the number eight pick. There a few options at this spot if some of the players fall, such as defensive end, Joey Bosa of Ohio State, offensive tackle, Laremy Tunsil of Ole Miss, and defensive end, DeForest Buckner of Oregon. Cleveland’s signing of Robert Griffin III was great, but they need to surround him with play makers. A great start to this approach would be running back, Ezekiel Elliott of Ohio State. Zeke is the total package for a running back as he can run, catch, and block. He also has explosive speed and raw power that can change the game instantly. Elliott excelled at Ohio State rushing for 1,821 yards and 23 touchdowns in his sophomore season, while leading the Buckeyes to a national championship in 2014. Browns running backs, Isaiah Crowell and Duke Johnson have shown some potential, but they don’t have the complete skill set that Elliott possesses. He is the three down back that Cleveland has needed for years. If Zeke is still on the board at number eight, I would be shocked if the Browns passed up on him. If Sashi Brown’s guy is gone by pick number eight, expect Cleveland to trade down between the 13 and 15 picks. One of the Browns biggest needs are wide receivers. Cleveland will most likely move on from Josh Gordon after his request for reinstatement was denied by the NFL earlier this month. New head coach, Hue Jackson, loves receivers and I expect the Browns to add a few in this years draft. 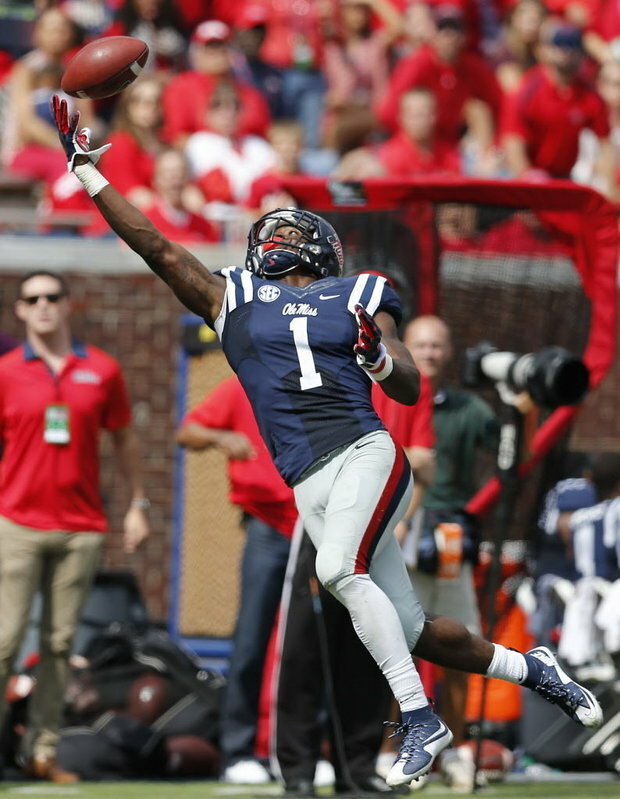 If Cleveland trades down I think they will take Laquon Treadwell from Ole Miss. Over the past few seasons the Browns have had mostly smaller receivers in the absence of Gordon. At 6’2″, Treadwell is not small by any means and he fits the mold of receiver that Jackson craves. He is known for his ability to go up and win contested catches. He is also very reliable when it comes to third down and red zone situations. The one area where Treadwell is weak is that he lacks the speed for deep routes. He often struggles to break past cornerbacks in those type of situations. Despite his lack of deep speed, I think Treadwell would be a great offensive weapon to add alongside RGIII. Cleveland holds the first pick of the second round (32 overall), a pick that was stripped from the New England Patriots as a result of the Deflategate scandal. Like the number eight pick, the Browns have plenty of options at number 32. Even though the Browns signed RGIII, they are still in the market for a quarterback. One option is Michigan State QB and Walsh Jesuit’s own Connor Cook. I think Cleveland is more likely to take him in the third round, but the second round is a possibility. Another option is an offesinve tackle. The Browns are in need of serious offensive line help after the departures of Alex Mack and Mitchell Schwartz. There are will many solid offensive lineman available, but I think Cleveland will hold off until the later rounds. I think the most likely option at number 32 would be a wide receiver. Like I mentioned earlier, Hue values his receivers and I would love to see the Browns take Michael Thomas from Ohio State. Thomas has great hands and a big frame at 6’3″ and 212 pounds. He has the speed and skill set to be Cleveland’s number one receiver, but he is more likely to start out as the team’s number two option. I think the Browns will stay put tomorrow night and select Ezekiel Elliott with the eighth pick. Zeke is a beast and he is the game changing player that Cleveland needs. I also think that the Browns will go receiver with the 32 pick and select Elliott’s college teammate, Michael Thomas.